COCHEM Flow is a Windows application for numerical simulations of two-dimensional transonic compressible wet steam flow with homogeneous and heterogeneous condensation. The software package consists of a computational module and a user-friendly graphical interface that includes complete pre- and post-processing. The software package was developed between 1993 and 2000, and later further improved by a number of new features and extensions. The computational concept was proposed by Prof. M. Štastný and the numerical model and the graphical user interface was developed by Dr. M. Šejna. The code was verified in the project RP 9003-01, "Steam Chemistry and Corrosion in the Phase Transition Zone of Steam Turbines" of the Electric Power Research Institute (EPRI) U.S.A.. COCHEM Flow is recommended as a supplementary program to the standard computation of turbine steam expansion. 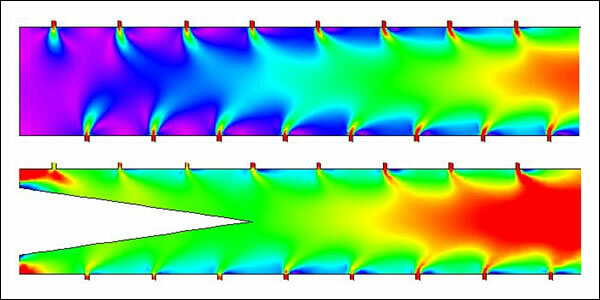 Although the specialty of COCHEM Flow is in modeling wet steam flow with homogeneous and heterogeneous condensation, the program can be also used for any other general calculations of two-dimensional compressible flow, including a transonic flow with shock waves. Thanks to the flexibility and robustness of the integrated FE-mesh generator, COCHEM Flow simulations can be done in any two-dimensional domain of arbitrary shape, including turbine planar blade cascades. When using the single-phase model, the program calculates basic properties of the flow field, such as velocity, density, pressure, Mach number, etc. All these quantities can be graphically displayed or exported for further post-processing. The mathematical model is based on the system of Euler equations, which is extended by additional equations for nucleation and transport of the liquid phase. The model, however, does not consider viscosity, nor turbulence. When the two-phase model is used, COCHEM Flow can determine zones of homogeneous condensation, the number of originating droplets, their average size and the corresponding wetness. It also can calculate steam sub-cooling and find the position of the so-called Wilson line and the condensation shock. In addition to homogenous condensation, the code can also simulate heterogeneous condensation, caused mainly by chemical impurities dissolved in the steam or the binary-condensation model can be used. It is possible to determine the solubility of corrosive salt (NaCl) in the superheated steam and to assess its precipitation. The code determines the position of "Salt solution zones" and calculates the concentration of sodium chloride in the created droplets. COCHEM Flow determines steam parameters on the blade surface and allows thus the prediction of corrosion attack on the blades. Flow can be steady or unsteady. The time-marching method is used to get the steady flow. Although COCHEM Flow was originaly developed for Windows 2000, it runs without any problems on all current Windows systems, including Windows Vista. The graphical user interface is easy to use and one can start working with the program without lengthy studies of manuals or special training. The main module manages data, allows input and editing of simpler parameters, and executes other modules of the software package. Data of one project has a three-level tree structure. At the very root is the geometry of the computational domain, the second level contains different FE-meshes for the given geometry, and at the third level one can define a number of tasks for different thermodynamic parameters, boundary conditions, and so on (Fig. 1). The GEOMETRY module (Fig. 2) is used for the design of the computational domain. The domain is defined by boundary curves that can consist of any number of polylines, arcs, circles or cubical splines. The domain can contain internal curves, points and holes. All geometrical objects can be inserted/edited grahically (by mouse), numerically (in dialogs) or can be imported from a text file. The FE-Mesh module (Fig. 3) generates unstructured triangular meshes for computational domains created in the GEOMETRY module. The first step of the mesh generation process involves discretization of the boundary curves, i.e., boundary nodes are generated on all boundaries and internal curves by dividing them in abscissas. Distribution of boundary nodes can be easily refined at any point or on any boundary curve, which allows the user to control the quality and size of the final mesh. The next step is either automatic or step-by-step generation of the triangular mesh. Automatic generation (recommended option) is a much faster and easier approach. By modifying the mesh generation parameters, the user can influence the smoothness of the mesh, its anisotropy, stretching and other special properties. The FE-Mesh module can generate unstructured meshes with up to one million triangles quickly and comfortably. The BOUNDARY module (Fig. 4) is used to specify boundary conditions. Four types of boundary conditions can be defined: Inlet, Outlet, Solid Wall and the so called Periodical Boundary. Condition ranges can be defined graphically by selecting boundary curves or their parts. Each boundary condition type is displayed in a specific color (blue, red, magenta, cyan) and this gives the user quick visual information about current boundary conditions. Different parameters can be specified on any part of input or output boundary. A two-dimensional wet steam flow is described by the system of Euler equations extended by equations for spontaneous nucleation and equations for transport and growth of water droplets. The mathematical model of the spontaneous nucleation uses the Becker-Doering formula for the nucleation rate that gives very good results for pure water steam. The numerical solver is based on the Finite-volume method and uses a hybrid explicit TVD/up-wind scheme applied to unstructured triangular mesh. The standard time-marching method is used to obtain a steady-state numerical solution. It is possible to run several calculation tasks on a single computer simultaneously or on several computers networked with a data server. Calculations can be interrupted at any time-step with an option to resume calculations later. It is also possible to use the results of one calculations as the initial condition for another problem, having the same or different FE-mesh, or even a slightly different geometry. The convergence of the numerical solution can be observed continuously in the calculation window or can be displayed as a XY-chart (Fig. 12). The GRAPHICS module can be used to display results of the simulation by means of isolines, spectral maps, velocity vectors, and a combination of both contour lines and spectral maps. Color spectrum, as well as the numerical increment between isolines, can be customized by the user. Flow animation for all variables is possible as well. Distribution of any quantity along a boundary or cross-section can be displayed as a XY-chart and its data can be exported for further post-processing. All documentation for the software package is available in electronic form. The program installs with a context-sensitive help that can be used as User’s Manual. The mathematical and numerical model is described in the Technical Manual that is available in PDF format. Fig.1 - The Main window serves as a three-level data manager and starts all other modules. Fig.2 - The Geometry editor. The computational domain can be defined in graphical mode (drawing), numerical mode (dialogs), or it can be imported from an ASCII file. Fig.3 - The FE-Mesh generator supports periodical boundary conditions and offers a number of ways to refine the FE-mesh according to task-specific requirements. Fig.4 - The Boundary conditions editor. Boundary condition types are differentiated by colors. 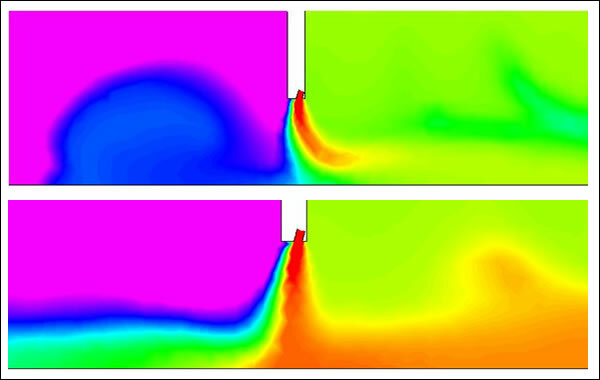 Fig.5 - Distribution of Mach number with a weak shock wave interacting with the homogeneous condensation. Fig.6 - Wetness color map. All quantities can be displayed as isolines or color maps using customizable color palettes. Fig.7 - Nucleation rate J. The numerical model can simulate homogeneous, heterogeneous or binary condensation. Fig.8 - Solubility of NaCl in the superheated steam helps to determine whether and where the turbine blades become endangered by corrosion. Fig.9 - NaCl concentration in droplets. It determines the position of "Salt solution zones". Fig.10 - Distribution of any quantity along any boundary curve or user-defined cross-section can be displayed as an XY-chart. Chart data can be exported. Fig.11 - Velocity vectors. The program allows customization of the graphical display by many options and scaling factors. Fig.12 - Convergence of the numerical colution. The calculation can be interrupted at any time step and, after viewing of intermediate results, can be resumed. Fig.13 - Mach number distribution. 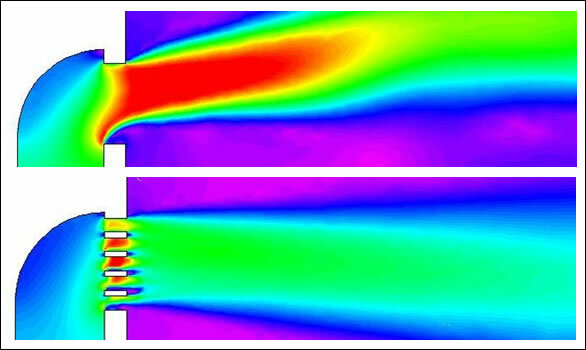 Transonic flow with homogeneous condensation in Laval nozzle. 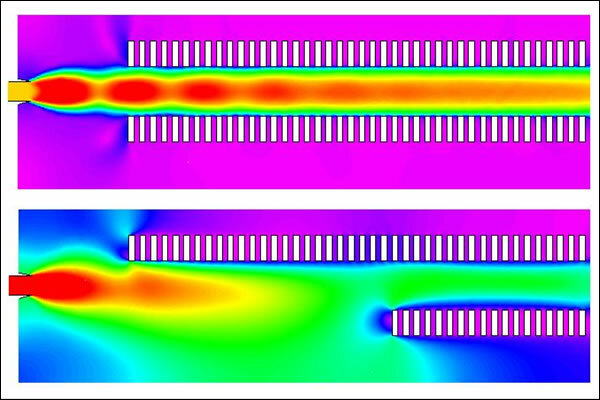 Fig.14 - Homogeneous condensation in transonic flow of wet steam through Laval nozzle. Fig.201 - Textile engineering, air-jet looms. Calculation of the flow through jet nozzles. Fig.202 - Drying technology. Calculation of the flow through spray drying nozzles. Fig.203 - Caclulation of the flow around a grass cutter blade. Fig.204 - Air-jet drying. Velocity vectors calculated in a simulation of drying wet surfaces by blowing air. Fig.205 - Drying technology. Calculation of the flow around a moving cylindrical body during transportation. 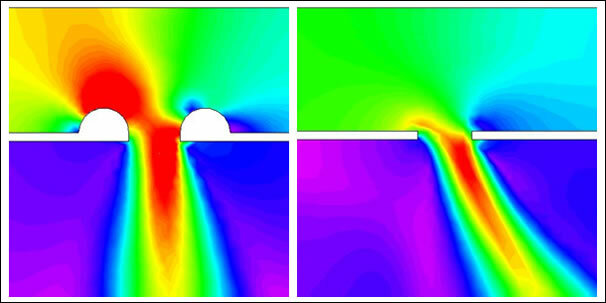 Fig.206 - Air Curtain simulation (a fan-powered device used for separating two spaces from each other). Fig.207 - Textile engineering, air-jet looms. Calculation of interaction of the fiber with the free stream. Fig.208 - Optimization of the air channel system. Calculation of the flow though a pipe with many connections. You can find more COCHEM Flow applications for example in the ARTI_Report_2001.pdf (2.9 MB) - Numerical Modeling of the Flow in Industrial Machines, Prof.K.Adamek, PhD, Aeronautical Research and Test Institute, Prague 9, Letňany 130, 199 05, Czech Republic.